Naseem Smith glanced down at the backpack on his lap and pointed to the neon lime Nikes strapped to the side. Smith first tried them on during his first season running track at Deptford Township High School, just two years ago as a sophomore. A former teammate let him borrow them. The rest, literally, is history. In each of the last two seasons, Smith has been one of the best hurdlers in the state and a part of one of New Jersey’s top relay teams, too. The Syracuse-bound senior still has a chance to go out with even more glory and hardware in the upcoming spring season, but his winter was worth remembering, too. Smith won the 55-meter hurdles at the South Jersey championships (with a time of 7.46) and managed to top that time at the Meet of Champions (7.43), where he was the runner-up to St. Augustine’s Sincere Rhea. He also helped lead Deptford’s 4×55-meter shuttle hurdle team to a time of 29.45 at the NJSIAA Group 2 Relay Championships, the fastest time ever at Bennett Complex in Toms River, a new overall state relays record, and the fourth-fastest time, regardless of venue or event, in New Jersey scholastic history. If all that wasn’t enough, Smith also got a new PR (personal record) of 7.42 at the New Balance Indoor Nationals earlier this month. 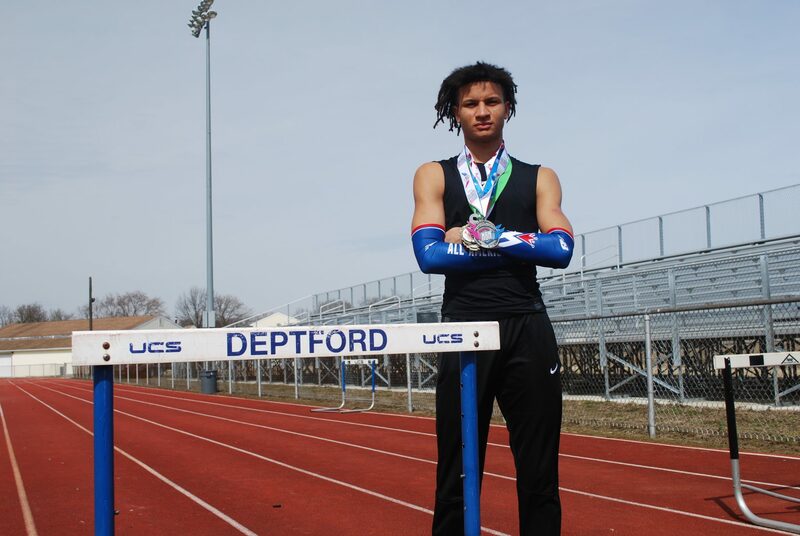 One of the most decorated track athletes in Deptford Township High School history, Smith earned another honor before the winter season gave way to spring: he is The Sun Newspapers Boys Winter Track Athlete of the Year. Deptford Township as a whole did a remarkable job this winter. Of the 11 athletes in South Jersey to be named Sun Athletes of the Year, three live in Deptford Township: fellow Spartan Paige Clegg (girls bowling) and Camden Catholic High School junior and Westville native Brandon Mooney (wrestling). The winter was full of memories for Smith, ones he’ll cherish even as he takes his career to new heights in the competitive Atlantic Coast Conference in 2019-2020. But the meet that sticks out to Smith from the winter was the last one, at nationals. Already considered one of the state’s best, Smith left the New York-based meet with a couple of new arm sleeves to designate his new accomplishment as an All-American. Deptford’s relay team ran a 30:19 at Nationals, placing third. 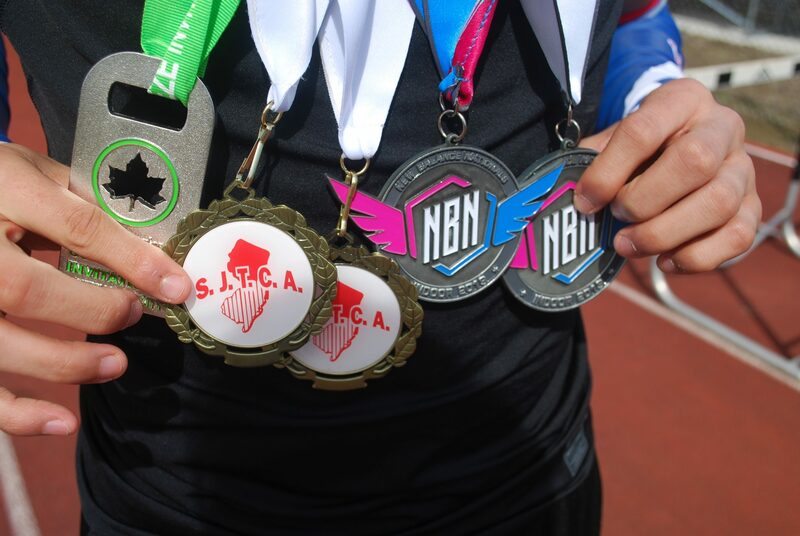 And it was also at Nationals that Smith hit his PR of 7.42 in hurdles (he ran a 7.47 in the finals to place fourth). “I ran my best time – 7.42 in my 60 hurdles,” Smith said of the season-ending event, pitting the best of the best from all over the country against each other. “So my 55-meter time was 7.42 and my 60 meter hurdle time was 7.99. You run through the 55 mark and all the way to 60, too. That was my PR for the whole season. Smith’s rise from track rookie to All-American is pretty remarkable, considering he entered high school thinking baseball as arguably his best sport. And that turned out to be bad news for fellow South Jersey hurdlers.